Bat Cat and I decided being lonely was preferable. We got our own, smaller place. I started temping, soon got hired full-time, and had no time to be lonely. But I felt bad about leaving Bat Cat all day. I went with a friend to a cat adoption event. I wasn’t looking for another cat. I was just loaning my friend a carrier. So of course I came home with Commando Cat, a crazy little brown and black kitten. Then all his brown fur fell out and I was the witchy cat lady with TWO black cats. Commando Cat on left, Bat Cat on right. Commando Cat wasn’t like Bat Cat. 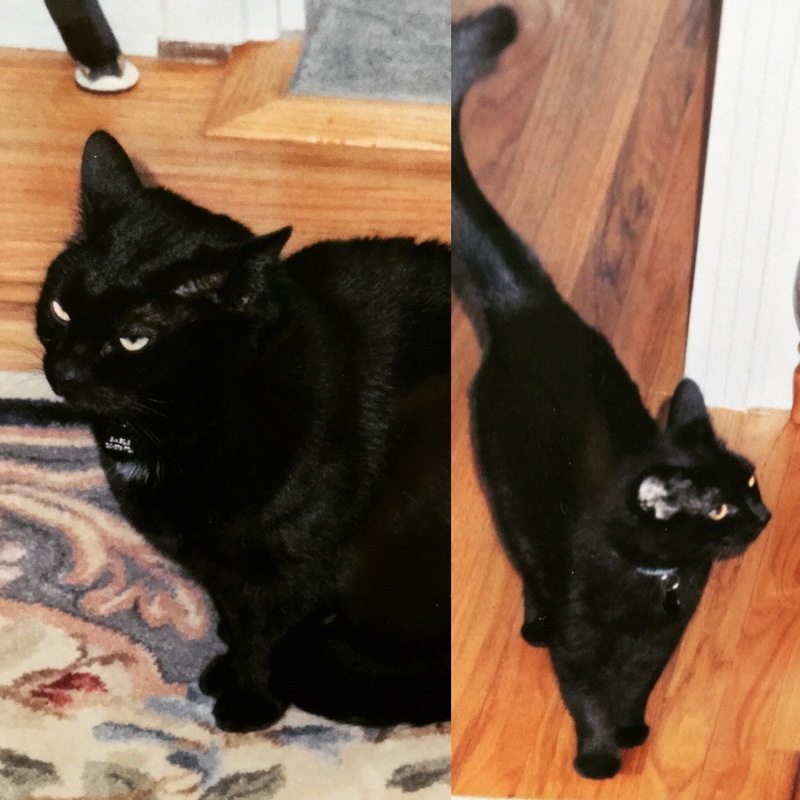 He wasn’t coordinated – Bat Cat could leap on top of open doors and perch there easily. Commando Cat fell off scratching posts with depressing regularity. Bat Cat was clever – she could open all doors, drawers, and cabinets. Meanwhile, Commando Cat got his head stuck in water glasses. Daily. He’d run around the apartment, cup on his head, unable to see, choking as he crashed into walls and trailed water everywhere. I finally packed away all glasses and used water bottles exclusively rather than stress over when (not if) Commando Cat would drown himself. My Chinese-American boyfriend Andy was one of the only guys I dated who seemed to like my cats. He’d throw toy mice or bits of paper, and Commando Cat would fetch them. (Bat Cat would turn her head away from these demeaning, dog-like games, as if to say, “I can’t watch. I’m embarrassed for my fellow cat.”) Commando Cat followed Andy around the apartment, waiting for Andy to play with him or sit down so kitty could have a warm lap. They were buds. Andy’s more of a dog person than a cat person, but after Newfie “puppy” Owen (100+ pounds) knocked Andy over for the fifth time, Andy was happy to get back to my apartment and the cats. He threw himself on my bed with a sigh. Commando Cat hopped on Andy’s stomach. And froze. His irises dilated. He lowered his head, sniffed Andy’s clothes, then raised his head. Commando Cat opened his mouth, curled his lips back, and froze once more. Commando Cat closed his mouth, lowered his head, and rubbed his face all over Andy’s stomach. Andy tried to pet the cat. Commando Cat ignored Andy’s hand, rubbing and rolling his body all over Andy’s torso. Commando Cat tried hard. He wiggled, slithered, rolled, and head-butted all over Andy’s shirt. He scooted down to Andy’s pants, twisting, turning, and rubbing his head until he got down to Andy’s kneecap. He threw himself into a good five-minute frenzy of further rolling and outraged mewing. 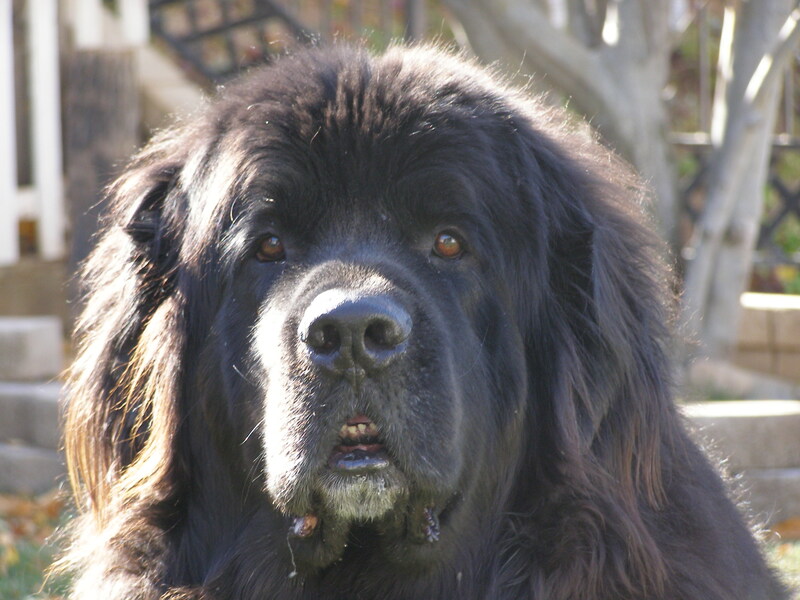 Sadly, Commando Cat’s eleven-pound body and scent glands simply couldn’t compete with the volume dried drool, fur, and unmistakable “eau de Newf” that over four hundred pounds of canine can create. Thwarted, Commando Cat hissed his rage, lowered his head one last time, bit Andy on the thigh, and ran away. Neither one ever fully forgave the other. 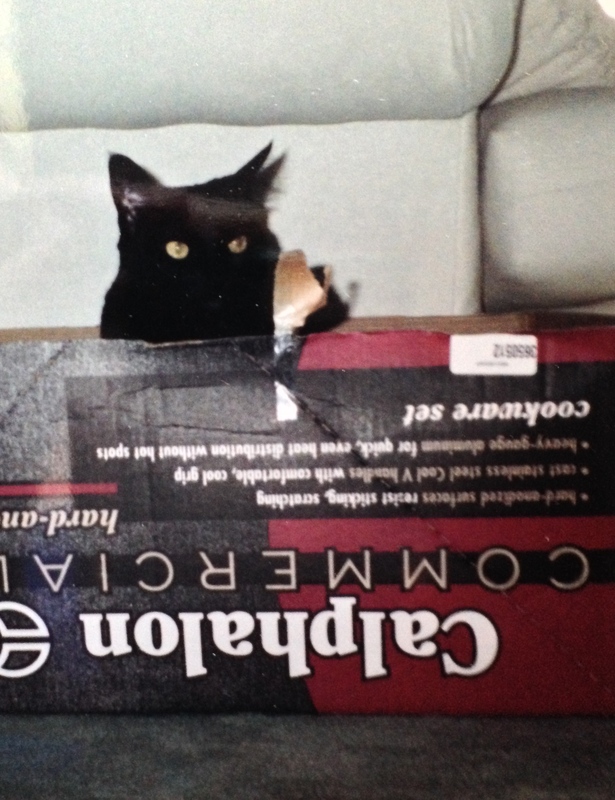 Commando Cat found a box — any box — preferable to eau de Newfie lap for weeks. Newfies are the juiciest of dogs. Poor Commando Cat! He must have been totally exhausted until that scent was gone. Did he try peeing on Andy’s clothes to get rid of it? Sometimes they do. Sends a message. Ha! No, Commando Cat was good. No peeing. Just a lot of nasty side-eye with his back turned. Animals are a never-ending source of amusement. I’m sorry Andy and Commando Cat never totally forgave each other. Ha, a dog “marked” Andy once. But that’s another story. You have a cat story? Got a link?